It’s expected that you’ll feel more than a little nervous before undergoing a major dental procedure like dental implants. Understanding the procedure helps put your mind at ease by showing you what to expect throughout the process. Below you’ll find details about dental implants in MI. Your dentist will complete a comprehensive physical examination, as well as get a set of x-rays and take a mold of your mouth that will be used to create a plaster model. Some offices have access to 3D imaging software that can be used instead of creating molds. The physical exam and imaging help your doctor evaluate important characteristics, such as bone density and missing teeth. The plaster models or 3D imaging help lab technicians create an implant that works perfectly with your anatomy. This process also helps the dentist prepare a temporary cap for the day your implant is placed. Your next appointment will be a surgical procedure to install your implant, and usually, a temporary crown. A local anesthetic will be used, although some offices offer other sedation methods. Damaged existing teeth are removed as needed. The surgeon cuts into your gum to expose the underlying bone of your jaw. He or she drills holes where the metal implant will be located. It has to be inserted deep into the bone, just as your teeth’s roots would be. Since you’ll have a space where your tooth is now missing, your doctor will likely provide you with a temporary crown in its place. Several months will pass before your next appointment. Your body has to be given time to heal from this procedure. But don’t worry, you shouldn’t feel pain or discomfort for the whole duration. It just can take months for the bone to integrate with the bone. Once your bone has fully healed, then you’ll have another appointment to insert a post into the implant. This post, called an abutment, is what your permanent crown attaches to. This is completed through a surgical procedure using a local anesthetic. 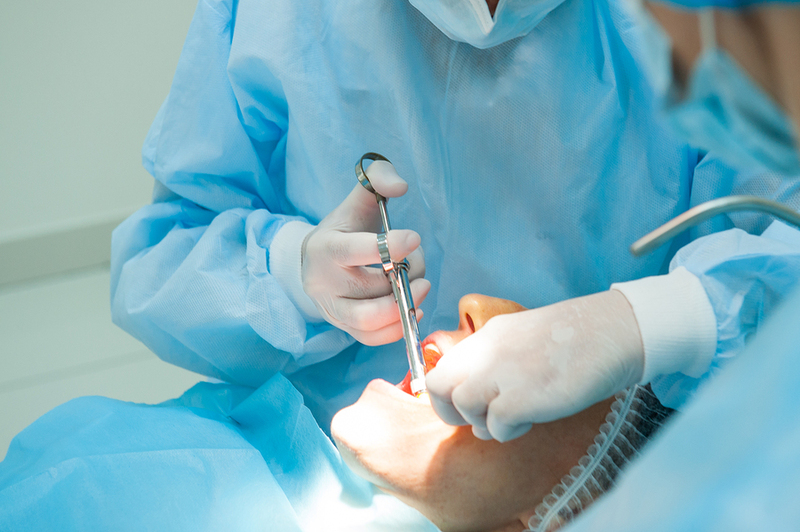 Your gums are opened to expose the implant, and then the abutment is attached. The gums will be closed around the device using a suture. The abutment extends past the gumline so it’ll be visible in your mouth after the procedure. Your gums must be given time to heal before your next appointment to be fitted with your new permanent artificial teeth. Once your gums have healed from inserting the abutment, then new impressions of your mouth will be created so that a model can be made. If your doctor has access to 3D rendering software, then they may skip this step because the software will be used to make a model of your mouth. This appointment doesn’t include any surgical procedures and is usually completed quickly. It could take several weeks for the lab to create your new tooth. Your last appointment consists of installing your new artificial tooth. The dentist may alter it slightly to create a perfect fit. Before you leave, he or she will make sure that you’re able to eat, drink, and speak without any problems. Michigan dental implants services are available through a number of local dentists. Make an appointment for an initial consultation to discuss whether this procedure is right for you.